(Trent Nelson | The Salt Lake Tribune) A roadside pile of debris at approximately 800 East 300 South in Salt Lake City, Friday Aug. 3, 2018. A run-down dresser with a missing drawer sits perched atop a blanket of tree branches in a neighborhood off 300 South and 800 East. It’s one of the smaller piles across the city, but neighbor Peter Conover said “it seems to be growing” — though the mattress that was there before has recently disappeared. 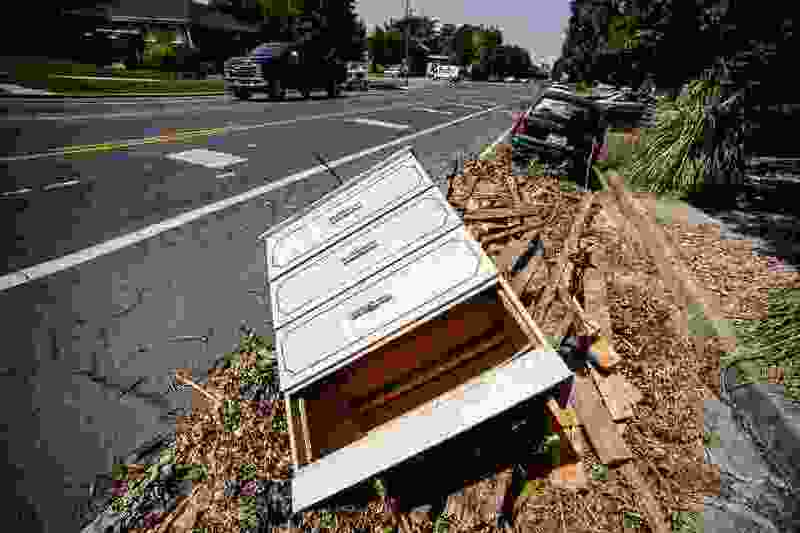 Salt Lake City’s new bulk waste pickup program, Call2Haul, was touted as a way to crack down on this illegal dumping. But one month in, trash continues to pile on streets across the city, and residents who do want to go through the proper channels are experiencing long wait times. Now that the program is limited to specifically prescheduled addresses, Allen said the illegal dumping may be more visible — but it’s likely not more prevalent than in the past. The city has received 32 reports so far in 2018 compared to 48 in the same time period last year, he said. The old curbside program was loved in some neighborhoods but became a problem in others, mostly with illegal dumping on the west side. That endangered storm water and environmental quality and created a flooding hazard as items blocked the drains, according to Sophia Nicholas, the communications director for Salt Lake City’s Sustainability Department. The vast majority of people are complying with the new system, Allen said, and the city has been working to address the garbage of those who aren’t. “It does put us in a tough spot, you know, with removing it and offenders believe that that’s acceptable behavior or leaving it in place and creating a health hazard in addition to that eyesore,” he said. Most of the dumping is happening in areas where it can’t be traced back to a particular individual, like in parking strips, outside apartment complexes or in fields. But at least one City Council member is ready to dump the new program. The city’s changes to its Neighborhood Cleanup program followed a survey last summer that received more than 4,000 responses and in which the new program was the choice of 49 percent of respondents out of four options. The new program offers residents the opportunity to schedule year-round pickups. Under the old system, the city would assign different areas a pickup time whether it worked with a person’s schedule or not. But now, residents can schedule one pickup a year, which for the first time includes up to four car tires and electronic waste. Tiffany Young, a Salt Lake City resident who lives near 800 East, was frustrated when she missed the city-assigned bulk garbage pickup date in her neighborhood back in 2015. Though Young hasn’t tried the new program yet, she thinks that old system might have been preferable. Long wait times to actually get a pickup date on the calendar have also caused frustration for some residents. Sarah Johansen, who lives in the Sugar House neighborhood, said she called the city to set up a trash pickup date on June 21 — three days after appointments opened. But six weeks later, she still doesn’t have a time set up to get rid of her old barbecue grill and a pile of other garbage. Allen acknowledged the backlog, noting that the city has received over 1,800 pickup requests and has people working overtime and weekends to get caught up. Residents who are calling to schedule now are automatically being assigned an October pickup date, he said. And though some have called for the city to go back to its old program, Allen said he thinks it’s too soon to say the new one won’t be a success.